Lecturers, organisation and participants of Tulip VII in Noordwijk, April 2018. Sitting from left to right, Ineke Weijer (organisation), prof. Wybren Jan Buma (University of Amsterdam, co-chair), Prof. Bas van de Meerakker (Radboud University, NL), Prof. Adam Cohen (Harvard, USA), Prof. Christian Bressler (European XFEL, Hamburg, DE), Prof. Ivan Powis (University of Nottingham, UK), Prof. Samuel Leutwyler (University of Bern, CH), Prof. Thomas Ebbesen (University of Strasbourg, FR), dr. Maurice Janssen (MassSpecpecD BV, co-chair), Miep Smits-Weijers (organisation). During the VII Tulip Summer School on Modern Developments in Spectroscopy (chaired by prof. Wybren Jan Buma and dr. Maurice Janssen) highly qualified scientists presented introductory and specialized lectures on various topics in the field of spectroscopiy and dynamics of (bio)molecular systems. The topics ranged from frequency-resolved spectroscopic studies of gaseous molecules, time-resolved studies using X-ray Free-Electron-Laser radiation, real-time dynamics in motor neurons, quantum state-resolved scattering of cold molecules, photoelectron spectroscopy and molecular nanophotonics. During this year's Tulip VII Prof. Ivan Powis (University of Nottigham, UK) introduced PhotoElectron CircularDichroism (PECD) as part of his lectures on the role of the continuum electron in modern spectroscopy. Below you can see some of the enthusiastic discussions on PECD between prof. Powis and the Tulip participants (Master students, graduate students and postdocs from all over Europe). Prof. Ivan Powis lecturing and discussing PhotoElectron Circular Dichroism with the enthusiastic participants at Tulip VII 2018. Prof. Bas van de Meerakker, Radboud University, The Netherlands. 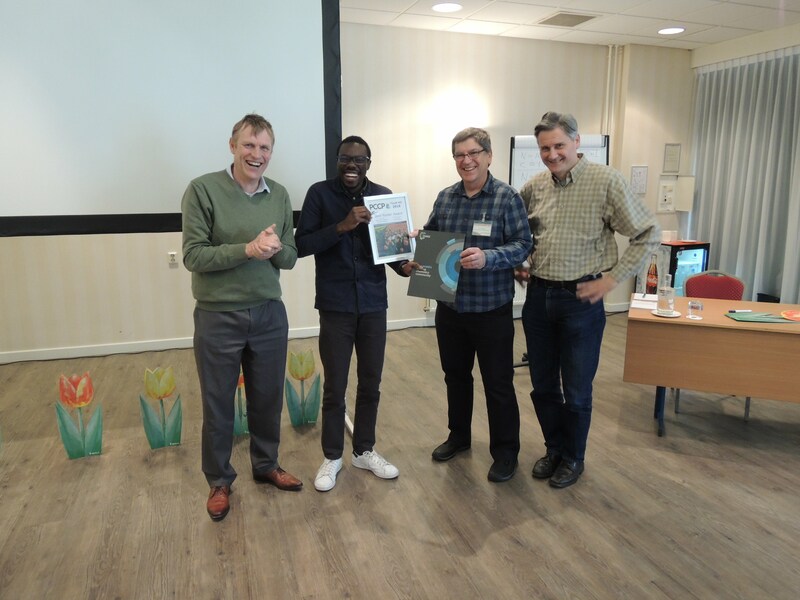 Pictured (left to right): Prof. Wybren Jan Buma (co-chair of the Tulip Summer School), Meissa Diouf (PCCP Poster prize winner for best presentation), Prof. Ivan Powis (lecturer at Tulip2018 and presenting the award on behalf of the committee of all 6 Tulip lecturers) and Dr. Maurice Janssen (co-chair of the Tulip Summer School). See the blog item by PCCP here. The Tulip Summer School is one of the educational activities organized by the Holland Research School of Molecular Chemistry (HRSMC) and has been held on a tri-annual basis since 2001. The HRSMC is a collaboration between top research groups of four Dutch Universities: the University of Amsterdam (UvA), the VU University Amsterdam (VU), Leiden University (UL) and the Radboud University (RU). It's main mission is to provide an extensive training programme for PhD students in chemistry. The HRSMC has been approved by the Royal Netherlands Academy of Arts and Sciences (KNAW). The HRSMC research school creates the conditions for a successful collaboration between the participating research groups and offers an extensive training programme for the PhD students in inorganic, organic, physical and theoretical chemistry, crystallography and mass spectrometry. For further information on the HRSMC see the website www.hrsmc.nl.